“A woman, desperate to get the best offers in the Wal-Mart sale, discharged pepper-spray at people in order to drive them away from the items she wanted.” This could be a scene from a Pedro Almodovar film had it not been seen in real life. On the 25/11/2011 such a story appeared in the Los Angeles Times. With that in mind, we could suggest that the large shopping centres, especially during sales, place prominent warning signs, parodying the Health Authorities’ -”Consuming seriously harms your health”. Moreover… irrational, superfluous and unnecessary consumerism, as promoted by the capitalist system, not only can affect our health, in such an unexpected and direct manner as a “pepper-spray assault”, but above all, affects the “health” of the planet. We are told to buy sunglasses by Chanel, a Tous teddy bear or Mango jeans as the only means to feel like Claudia Schiffer, Jennifer Lopez or Gerard Piqué. The days of selling just a product has passed into history. Now, as all good schools of marketing teach, they sell us the celebrity and package with the promise of “health, money and love”. And we pay, pleased as Punch, the price of our dream. They sell us the incidental as indispensable and the trivial as life or death, and create for us a whole range of spurious needs. Change of clothes every season, a mobile of the latest generation, a plasma TV and so on, and so on … With a consequent pile, of technological, electronical, and sartorial waste…that vanishes once out the door, going to swell the scrap heaps of the Global South, polluting water and land, and threatening community health. Or else, the system’s counter offence of programmed obsolescence… planning expiry dates for all that we buy, so that after the determinate amount of time, it fails and you have to buy another. What good is an everlasting light bulb, stockings that resist ladders or a computer that does not work? All bad business. Here, he who sells is the only winner. Perhaps the time is ripe to instil the idea that we could “live better with less” and to examine the complicity desired of us, with a system imposed upon us that benefits only the same as always. We are told that there is a consumer society because we love to consume, but – aside from our own individual responsibility – no one, to my knowledge, chose this society in which we happen to live or at least I myself was never asked. It’s just that, from diapers until dentures we are bombarded with “buy… buy… buy” and their message continues today, we will leave this crisis ‘consuming’. 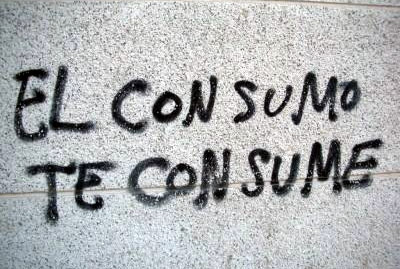 I ask myself, “consuming” or “being consumed”?